Jeremy performed February 11th, 2018 on Show 349 in Boston, Massachusetts. 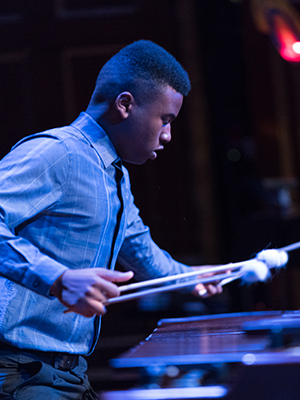 Jeremy Davis (marimba), 17, lives in Chino Hills, California where he is a junior at Diamond Bar High School and studies percussion with Kenneth McGrath. He is a recipient of From the Top’s Jack Kent Cooke Young Artist Award. His favorite musical experience has been participating in Carnegie Hall’s National Youth Orchestra of the United States in 2017. Jeremy says his proudest musical accomplishment has been being selected to appear on From the Top. Outside of music, he enjoys playing basketball and tennis. Jeremy is a Jack Kent Cooke Young Artist.